This program serves to strengthen the internationalization of the educational experience for scholars, host institutions, and students by welcoming educators from North America to university campuses in Germany for guest lectureships. The advent of international degree programs, as well as the distinguished traditional curricula at German universities, Fachhochschulen, and arts colleges, provide myriad opportunities for professors from the United States to contribute their topical expertise and teaching methods. The lack of restrictions on disciplines and subject matter makes this one of DAAD's most dynamic programs; and it follows that courses may be taught in English, French, or German. This program is open to highly qualified scholars in all disciplines who hold a doctorate or other terminal degree, and have an affiliation with a higher education institution. Exceptionally talented experts in their field who are not full-time educators will also be considered. As the applicant, the German host institution receives the DAAD funding. 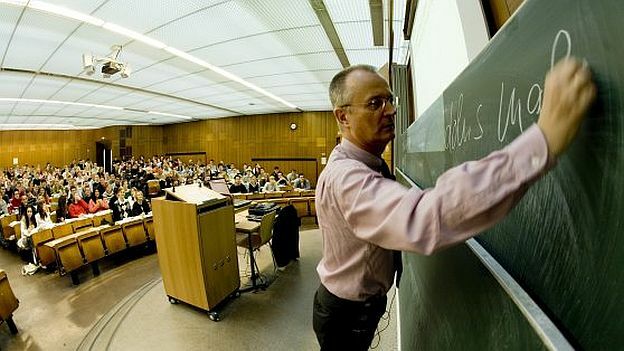 Visiting Professors are paid by the host institution according to standard salary rates for civil servants and university faculty in Germany. Travel subsidies range from EUR 925 - EUR 1,875 depending on which region you travel from to Germany, and additional allowances for luggage and health insurance can be made. Funding is available for periods of three months to two years. Candidates must secure an invitation from a German host institution prior to the application for funding, and teach courses integrated into the regular curriculum. A full description of this program and application guidelines are available here (in German): Gastdozenten an deutschen Hochschulen. As mentioned above, the German host institution files the application (with the candidate supplying CV and input on the courses to be taught), so most of the information is in German. The application period is from October 5th, 2017 to January 15th, 2018. Please review the above guidelines for application modalities. If you have further questions, please contact Hans Jürgen Kaminsky at kaminsky(at)daad.de. Still looking for a host institution? Try the Advanced Academics page of our Reference Center section. If you read German, the Tarifvertrag im Öffentlichen Dienst (TVÖD/TV) or Bundesangestelltentarif (BAT) calculators can help estimate salary. Average salaries are also given in the Personalmittelsätze der DFG.